Pope Has a New App!! VATICAN CITY — The Vatican launched a new “Pope App” on the eve of the release of the pope’sWorld Communications Day message, which will be dedicated to social networks as important spaces for evangelization. The new app provides live streaming of papal events and video feeds from the Vatican’s six webcams. It sends out alerts and links to top stories coming out of the Vatican’s many news outlets as well as posts images and quotes from Pope Benedict XVI. The app is still in the 1.0 stage so as updated versions come out, there will be a search function for archived media, and links will eventually be shareable online. “The Pope App” went live today for iPhone and iPad, while an Android version should be out by the end of February. It’s currently available in English, Spanish, French, Portuguese and Italian. The Vatican has been stepping up its digital presence in recent years — for itself and the pope — the latest initiative being the papal Twitter feed @Pontifex, which now has more than 2 million followers in nine languages. The new app will allow people tofollow live broadcasts of papal events — like the Sunday Angelus, Wednesday general audience and other important events — as well as access images and other media from any mobile device or smartphone. The new “Pope App” will alert users when an event is about to begin and the mobile device will receive the live feed directly from the Vatican Television Center. 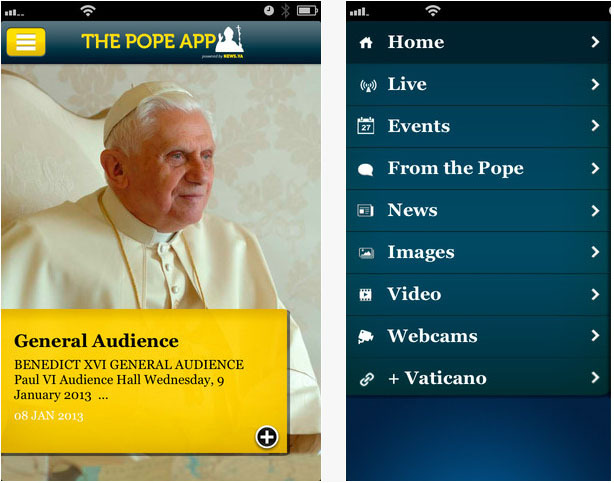 The app also will give users views from any one of the Vatican’s six live webcams. Two webcams are located on the dome of St. Peter’s Basilica: one looking at St. Peter’s Square and the other at the Vatican governor’s office. Another is situated high on the colonnade around St. Peter’s Square looking at the basilica and papal apartments. One is directed at Blessed John Paul II’s tomb in St. Peter’s Basilica, another is high on the Vatican hill pointing toward the dome of the basilica and the last is aimed at the gardens of the papal summer villa in Castel Gandolfo. “The Pope App,” was launched the day before the feast of St. Francis de Sales, the patron of journalists, and day the Vatican traditionally releases the pope’s message for World Communications Day. The theme of this year’s message, “Social Networks: Portals of Truth and Faith; New Spaces for Evangelization,” is in the context of the Year of Faith and fresh calls for a new evangelization.